WARSAW, Poland—Vice President Mike Pence, speaking before leaders from more than 50 countries, offered a stinging rebuke of leading European nations for their back-door efforts to help Iran skirt U.S. sanctions, demanding these countries follow the White House's lead and scrap the landmark nuclear deal, which has been on life support since President Donald Trump abandoned the Obama administration's chief foreign policy achievement. Pence was direct in his rebuke of key European allies—most notably France, Germany, and the U.K.—expressing a level of frustration that has not often made its way into the public discourse. The forum itself was noteworthy: Pence slammed European leaders in front of foreign ministers from scores of countries, including leading Arab nations. Pence's remarks put the issue of Iran and its contested nuclear program back on the front burner as Secretary of State Mike Pompeo and international leaders met to discuss a wide-range of challenges facing the Middle East. The ministerial, initially billed as an effort to counter Iran, was notable in recent days primarily because it appeared Iran had disappeared from the agenda. Pence put the focus squarely back on Tehran, warning European leaders their efforts to appease Tehran and keep its economy from collapsing will not be treated kindly by the Trump administration. "Sadly, some of our leading European partners have not been nearly as cooperative—in fact, they have led the effort to create mechanisms to break up our sanctions," Pence said. "Just two weeks ago, Germany, France, and the United Kingdom announced the creation of a special financial mechanism designed to oversee a mirror-image transaction system that would replace sanctionable international payments between EU businesses and Iran that don't technically cross Iran's borders." "They call this scheme a ‘Special Purpose Vehicle,'" Pence said. "We call it an effort to break American sanctions against Iran's murderous revolutionary regime. It is an ill-advised step that will only strengthen Iran, weaken the EU, and create still more distance between Europe and the United States." One senior Republican U.S. official who works closely with the administration on Europe issues expressed a level of shock over Pence's comments, telling the Washington Free Beacon he "ripped them a new one." "The Trump administration has tried everything imaginable to cajole, persuade, demonstrate, convince, and otherwise show the Europeans that they should side with us against Iran," said the source, who was not authorized to speak on record. "It's been a full blown multi-year campaign that took thousands of staffer hours, not because the Europeans can significantly undercut American sanctions but because they're our allies and we want them on board. Meanwhile the Iranians increased their terrorism in Europe and accelerated ballistic missile development. But despite all that the Europeans still chose Iran over America. So Pence went over there and publicly ripped them a new one. It was the only option left." Pence also pushed European countries to abandon the nuclear deal. "Some argue that Iran is in technical compliance with the narrow terms of the deal," Pence said. "But compliance is not the issue; the deal is the issue. Today, America's economic sanctions on Iran are the toughest in history and will get tougher still unless and until Iran changes its dangerous and destabilizing behavior." "The time has come for our European partners to stand with us and the Iranian people … to stand with our allies and friends in the region," he said. "The time has come for our European partners to withdraw from the Iran nuclear deal and join us as we bring the economic and diplomatic pressure necessary to give the Iranian people, the region, and the world the peace, security, and freedom they deserve." The hardline regime, Pence said, will not be permitted to carry out its plans to annihilate Israel and topple U.S. forces in the region. "The authoritarian regime in Tehran represses the freedom of speech and assembly, persecutes religious minorities, brutalizes women, executes gay people, and openly advocates the destruction of the State of Israel," Pence said. "In Lebanon, Iran's proxy Hezbollah has built an arsenal of more than 100,000 rockets and missiles, equipped with Iranian-supplied advanced guidance systems." 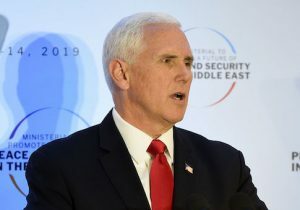 Pivoting back to Europe's efforts to coddle Iran, Pence urged leaders to move further toward the Trump administration's position, which appears to suggest that regime change in Iran is an option. "The world missed an opportunity last time to confront the regime, but not this time. This time, all of us must stand strong," Pence said. "As Iran's economy continues to plummet, as the people of Iran take to the streets, freedom-loving nations must stand together to hold the Iranian regime accountable for the evil and violence it is inflicting on its people and the rest of the world."